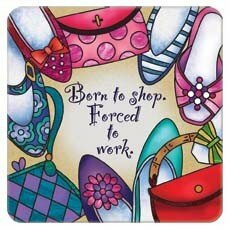 Those of you who know me would undoubtedly agree that this mantra certainly describes an aspect of me. 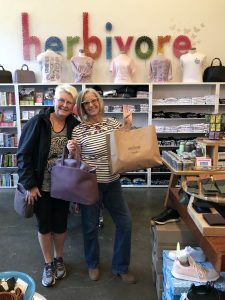 So, in all good faith and not wanting to disappoint you, this blog is about Kris’ and my shopping extravaganza at Portland’s Herbivore Clothing during our October Portland Veg Tour. Many of you may be familiar with their online store, which was established in 2002. Owners John and Michelle actually ran their business for their first five years using spare bedrooms. Not allowing that to become a barrier, Herbivore Clothing very quickly became one of the forerunners in the online vegan clothing, accessories, books, etc. market. When Herbivore Clothing, together with the founder of Sweet Pea Baking Company; Food Fight! Vegan Grocery Store; and Brian and John, owners of Scapegoat Tattoo (there will be an upcoming blog dedicated to our time there), decided to rent the block of vacant shops on Stark Street and the corner of 12th Street. It is now fondly referred to as Portland’s Vegan Mall. 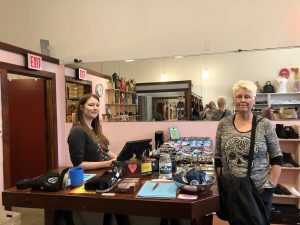 Kris and I spent a couple of hours checking out all the wonderful items in their store, which includes shoes (shoes are only available in their store, not on their website), books, gift items, clothing and accessories, greeting cards, around-the-house items. We tried on all sorts of t-shirts, sweat shirts, and other clothing. We each landed with a couple of them, all of course, with vegan slogans and images on them. But, of course me being me, that wasn’t to be all I purchased. There was an amazing pair of floral shoes that I kept trying on hoping against hope that somehow they would miraculously grow a size. ☹ Never did happen, so I was forced to move on. I landed with a pair of super comfy black sandals from Native. Oh, and they had that four-letter word on a sign over them – SALE! How could I resist. I didn’t even try. They went straight to the counter to be added to my pile. has a wide array of vegan handbags, knapsacks, and the like. Purple is one of my two favorite colors, so how could I pass up a Matt and Nat mauve bag? I couldn’t. It’s the perfect pocketbook with several pouches inside the zipper area and two outside pouches. I simply LOVE it. And their prices were seriously competitive. In fact, I purchased a Pixie satchel bag in a shop in Sedona that carries vegan items. I paid $110 for it. Not on sale, at their regular price, was the exact same bag at Herbivore Clothing for $40. Yes, I did say $110 and $40. Huge difference! 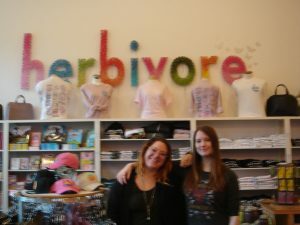 Sorry this photo is blurry; but it was the only one taken of Herbivore Clothing’s amazing staff, so it needed to be included, blurry or not. They were so friendly, helpful, and knowledgeable. They made our experience all the more fun with their jovial personalities. Living in the Sedona/Verde Valley, the shopping are minimal unless you drive down to Prescott, even further to Phoenix, or head north to Flagstaff. Online shopping has become the norm in these parts, unless you are planning to shop at Walmart or Home Depot, your only choices. So you can probably imagine how delighted this vegan was to find a shop that is very reasonably priced, with incredible staff, and I was able to shop and not be concerned whether something was vegan or not….because it was all vegan! What a shopping treat! around the airport awaiting our return flight home, we happened upon a non- vegan store that had a rather nice selection of vegan shoes, bags, and wallets. 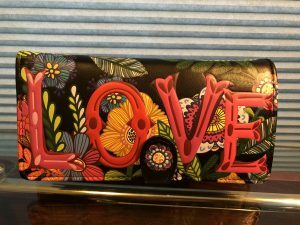 I’d been in the market for a new wallet for months, but to no avail. Alas, there it was. In this non-descript airport store! It’s by a company called ShagWear. It’s a bi-fold wallet with lots of spaces for credit cards, licenses, bulk store membership cards, driver’s license, etc. And then it has 3 long slots for other documents not needed on a regular basis. It even has a zipper, that when opened, reveals two slots, perfect for bills on one side and loose change on the other. And the outside design, oh, this hippie in spirit is completely delighted! 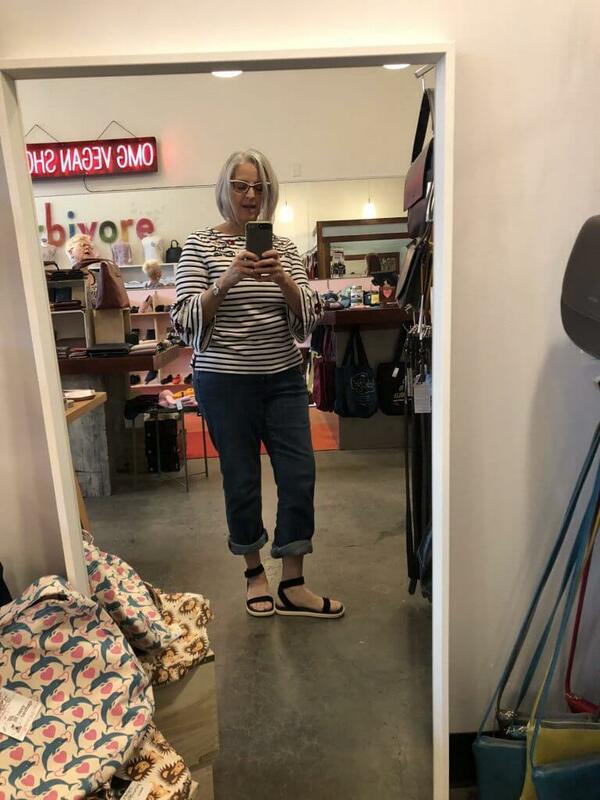 Whether visiting Portland or shopping online, my go-to from now on for all things vegan (except food) is Herbivore Clothing.